The far side of the moon has received a lot of attention lately. In early 2019, China landed a rover on the far side, which can now be seen in a stunning photo taken by the Chinese satellite DSLWP-B or Longjiang-2. 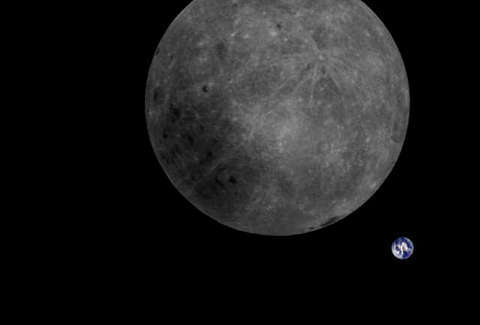 It's an angle showing the side of the moon that never faces the Earth, with the little blue Earth photobombing far in the background. Longjiang-2 is one of a par of microsatellites China launched last year to orbit the moon in anticipation of the Chang'e 4 lander's mission to put the Yutu 2 rover on the moon's surface. Only one of the two satellites is currently orbiting the moon, delivering this rarely photographed angle. The image, taken February 4, shows the "dark side of the moon" in full sunlight. It drives home why it's properly called the far side of the moon and not the dark side. Though it's never facing the Earth, it does frequently bask in the sun's warm glow. Tammo Jan Dijkema of the Dwingeloo Radio Observatory in the Netherlands said on Twitter that it took his team almost 20 minutes to download this image. The astronomers at the Observatory volunteered its sensitive radio antenna to receive images from Longjiang-2, per Space.com. They also noted that the image was color-corrected. Dijkema shared the purple-hued original, which is its own kind of beautiful. "The colors in the photo have been patched afterwards," Dijkemma wrote in a blog post about the image (via translation). "Since the camera does not have an infrared filter in the satellite, the colors are far too red... we have adjusted it to bring the colors in balance, and then show the moon in shades of gray." In an interview with the Dutch news station RTV, Dijkemma said the images are "not very clear" with a maximum resolution of 640x480 pixels. "But we're doing out best with the constraints that we have to take the most beautiful photos possible," he said. The images are still beautiful, despite the clear camera's limitations.